I've been eating yogurt faithfully for the past 8-10 years. One of the reasons I started eating yogurt was for health reasons but quickly fell in-love with it simply because it tastes good. It is a quick and easy snack for me and one that my family also enjoys. Müller yogurt has been in business for more than a century and is the leading brand of yogurt in Europe. The company is known for making rich, creamy whole milk yogurts that taste delicious. They are gluten-free, contain no high fructose corn syrup, no artificial flavors, sweeteners or preservatives. Müller has introduced a new line of ice cream inspired yogurt flavors and I was given the opportunity to try them all out. Each of these yogurts are 210 calories are less and made with whole milk! They are a good source of protein and an excellent source of calcium. As a big yogurt lover, I was super excited to try them out. Since I am not selfish, I gave the Rich Vanilla Bean one to my mother and I enjoyed the Raspberry Chocolate Chip yogurt for breakfast a few days ago. Oh my gosh...these yogurts are better than the previous brand I was enjoying! The following day I enjoyed the Classic Strawberries & Cream and the day after that I finished up with the Refreshing Mint Chocolate Chip. These yogurts have TRUE flavors...they taste exactly what the name implies. They have a very creamy, rich and smooth texture to them...nothing chunky at all. I really appreciated that they were not overly sweet and they were very filling! Since I don't get enough calcium in my diet, I love that they are an excellent source of calcium and protein. Since reviewing them, I've honestly changed over to this yogurt brand (so has my mother). 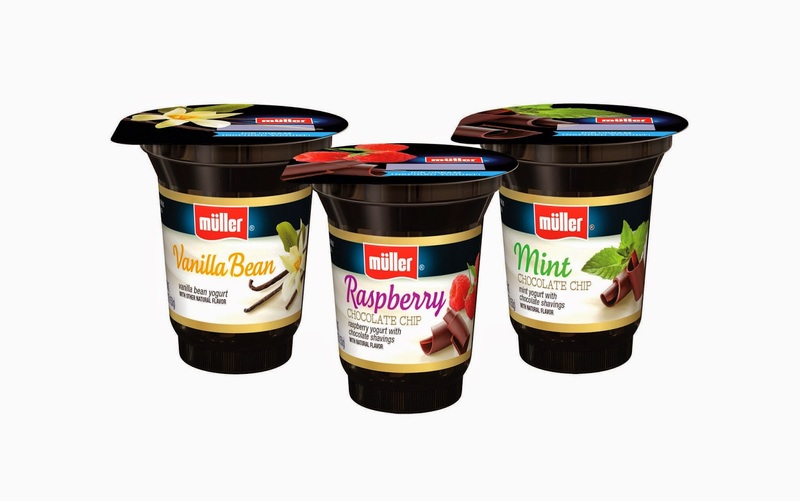 If you love yogurt, you really need to give Müller a try! You can learn more about the company and their products by visiting their site online. Giveaway: One lucky winner is going to win one insulated cooler tote (shown in top photo), 4 cups of yogurt and coupons from Müller. Giveaway Details: This giveaway is open to residents of the USA ONLY who are age 18 and over. Please read the Terms of Service and Disclaimer Policy before entering. You must be a PUBLIC FOLLOWER of this Blog to have your entries count in my giveaways. (Follow via Google Friend Connect) All non-blog followers will have their entries disqualified after the giveaway closes. This giveaway will close on March 16th, 2015 at midnight EST time. ** NOTE ** Sponsored requested that I change the end date to March 16th, 2015 at midnight EST time. I LOVE the new Muller Ice Cream Inspired Yogurt. Majorly addictive! LOve all the flavors! Yes, I do like yogurt. I usually buy quarts of plain yogurt, then flavor it with honey or jam, and sometimes I stir in some Grape-Nuts. If I see a good sale on individual yogurt cups, I like to buy fruit flavors like orange, blueberry, and raspberry. I entered the TCC giveaway for a $25 e-Gift Card to HomenYard.com. I love yogurt. My favorite flavor is raspberry. I entered the Ends 03/17 Neater Scooper for Cats giveaway. I follow the Shakin 'N Bakin Foodie Blog via Google Friend Connect as shelley. I do like yogurt. I like regular or vanilla yogurt with berries like blueberries, strawberries, and some granola for a little crunch. I entered the Night at the Museum blu-ray/dvd giveaway on the TCC blog. My favorite is blueberry greek yogurt, thanks! I love yogurt and blueberry is my favorite. I love yogurt and vanilla is my favorite flavor! I entered the Alphabetized Card File Wallet giveaway on TCC. I enjoy yogurt and eat it almost every day. My favorite flavor is strawberry. Peach is my favorite yogurt flavor. I entered the neater scooper for cats giveaway on TCC. I want to eat more yogurt and try to. I like strawberry banana best. My daughter eats yogurt daily...plain and cherry vanilla. I entered $25 Homenyard giveaway. I entered the Ends 03-19 Dial Miracle Oil Body Wash giveaway. I entered the Dial Miracle Oil Body wash on the TCC blog. I love yogurt! I especially enjoy yogurt with big chunks of fruit. I entered the Dial Body Wash giveaway on TCC. I entered the Ends 03-19 SPARK Energy Mix by Advocare giveaway. I entered the Dial Miracle Oil Body Wash giveaway on the TCC blog. I love yogurt and eat a cup everyday. Strawberry is my favorite. I entered the Spark Energy mix giveaway on TCC. I entered the PLAYMOBIL Easter Egg giveaway on tcc. I repinned the pin Dry Tortugas National Park, Florida. I entered the Ends 03-22 $25 Value Surprise Box of New Baby Essentials from MAM Baby giveaway. I entered the 3 bottles of softsoap giveaway on the TCC blog. I'm really picky about my yogurt, it needs to taste like yogurt.I'm am fond of black cherry, if I had to pick one. i love vanilla yogurts - especially with mix ins! I entered the baby essentials from MAM giveaway on TCC. I like yogurt and I guess my favorite flavor is black cherry. We love yogurt especially vanilla, cherry or strawberry!